COLD FOOD TABLES    Mec ReFRigeRated cold Pan tables han lly Ta • Precision Thermostat For Exact Temperature Control • High Cooling Capacity • Sight Glass To Ensure Properly Charges System • Low Running Current ica Assi ste dC old Pan ble s           • 304 Stainless Steel Body, Top and Legs • Adjustable Bullet Feet • Heavy Duty Cabinet Base • 8” Wide Poly Cutting Board Shelf - Ships K.D. • 1” I.P.S. Drain Enclosed Base Model # Price MACP-2-BS $8926 MACP-3-BS 10078 MACP-4-BS 10891 MACP-5-BS 11884 *Width Includes 8” Cutting Board w/ Sliding Doors Model # Price Length MACP-3-DR $10460 47-1/8” MACP-4-DR 12111 62-7/16” MACP-5-DR 13261 77-3/4” *Width Includes 8” Cutting Board Cu. Wt. Ft. 230 lbs. 39 256 lbs. 56 380 lbs. 73 465 lbs. 90 Cu. Wt. Ft. 385 lbs. 41 420 lbs. 73 505 lbs. 90 Enclosed Base MACP-3-BS Shown Sliding Doors MACP-3-DR Shown Cold Pan Table Covers   Length Width* 30-5/8” 30-5/8” 30-5/8” 30-5/8” Width* 30-5/8” 30-5/8” 30-5/8” Refrigerant R404-A R404-A R404-A R404-A Refrigerant R404-A R404-A R404-A  31-3/16” 47-1/8” 62-7/16” 77-3/4” SU-P-234 - 6’ Cord with NEMA 5-15P plug Included      SU-71 5 Year Extended Parts Warranty on Refrigeration Unit (Available for Refrigerated Tables & Drop-Ins. See Back Inside Cover For Full Details) $461 Per Unit • Stainless Steel • Plastic Handles • Piano Hinge(s) • Fits CPU, DICP MACP & BMACP Units Model # Price HC-2 $348 HC-3 521 HC-4 571 HC-5 663 Length 28-9/16” 43-7/8” 59-3/16” 74-1/2” Cu. Wt. Ft. 12 lbs. 3 16 lbs. 4 20 lbs. 5 24 lbs. 6  NOTE: Units are not designed to cool foods originally warm. Food should already be chilled to maintain the proper temperatures WARNING: Refrigerated Equipment on this page may expose you to chemicals, including Ethanes, that are known to the State of California to cause cancer or birth defects or other reproductive harm. For more Info.,visit www.p65warnings.ca.gov. 126 12” WIDE Model Price STOS-2 $784 STOS-3 890 STOS-4 1003 STOS-5 1086 SU-25S SU-25 TA-25 TA-255P Approx Wt. 18 lbs. 21 lbs. 24 lbs. 27 lbs. 18” WIDE Model Price Length Wt. Ft. 12” WIDE Model Price TOS-2 $1423 TOS-3 1662 TOS-4 1898 TOS-5 2135 18” WIDE Wt. Model Price Length Wt. 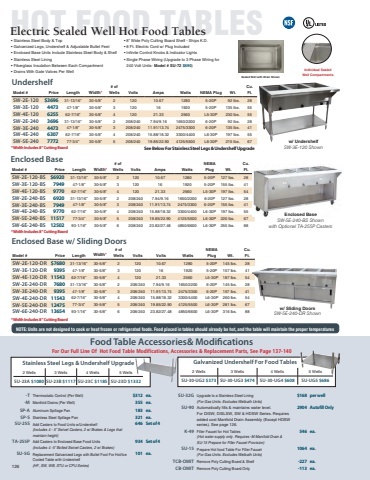 Ft. Food Table Shelving For Our Full Line Of Hot Food Table Modifications, Accessories & Replacement Parts, See Page 131-134 15” Height Single Overshelves 12” Height 15” Height    STOS-2-18 $997 31-13/16” STOS-3-18 1074 47-1/8” STOS-4-18 1163 62-7/16” STOS-5-18 1269 77-3/4” 20 lbs. 23 lbs. 26 lbs. 30 lbs. 3 4 5 6 32 lbs. 38 lbs. 44 lbs. 49 lbs. TOS-2-18 $1691 TOS-3-18 1952 TOS-4-18 2231 TOS-5-18 2504 31-13/16” 47-1/8” 62-7/16” 77-3/4” Add Casters to Food Units w/Undershelf (Includes 4 -5” Bolted Swivel Casters, 2 w/ Brakes) Add Casters to Food Units w/Undershelf (For Units Built Before October 2015. Includes 4 - 5” Swivel Casters, 2 w/ Brakes.) $375 375 Set of 4 Set of 4 Set of 4 Set of 4 SU-19 Prepare Hot Tables to be Locked Together (One Charge For Each Table To Be Interlocked) SU-45A 12” x 1” Adapter Bar SU-45B 20” x 3” Adapter Bar TCB-OMIT Remove Poly Cutting Board & Shelf CB-OMIT Remove Poly Cutting Board Only Sleek ShieldsTM Are Also Available For Hot & Cold Replacement Casters For Undershelf Units 375 (For Units Built After October 2015. Includes 4 - 5” Swivel Casters, 2 w/ Brakes.) Add Casters to Enclosed Base Food Units 606 (Includes 4 -5” Bolted Swivel Casters, 2 w/ Brakes) 58 ea. -200 ea. -100 ea. Approx Cu. Approx Approx Cu. Food Table Accessories Double Overshelves   35 lbs. 3 56 lbs. 4 66 lbs. 5 76 lbs. 6 $513 ea. 52 ea. Food Tables. See Pages 130 For Details.